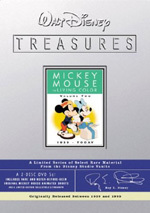 With the wonderful “Walt Disney Treasures” sets meant for the serious collectors, we now get another series aimed more at casual fans of animation. Entitled Starring Mickey, this one presents seven of the Mouse’s adventures in one package. Those die-hard fans will already own all of these shorts via a combination of Mickey Mouse in Living Color and Mickey Mouse in Living Color, Volume 2. “On Ice” also appears on The Complete Pluto, Volume 1. Mickey’s Circus (1936, B. Sharpsteen): Mickey puts on a show for the kids along with help from Donald Duck. This is a Mickey short in name only. The Mouse sits in the backseat as Donald becomes its dominant focus. At least he gets some good moments and makes this a solid cartoon. A wild tightrope sequence elevates “Circus” to greatness. 9/10. Mickey’s Garden (1935, W. Jackson): Mickey tries to rid his garden of insects. After the prior short’s Duck-related delights, “Garden” lacks much punch. An aggressive Mickey isn’t a very convincing character, and the battle against the bugs is too one-sided. Mickey’s hallucinations when he accidentally ingests pesticides offer some clever elements, though, and help redeem this otherwise mediocre short. 7/10. The Little Whirlwind (1941, R. Thomson): Mickey cleans Minnie’s yard in return for food but runs into problems when a tiny tornado creates messes. Like “Garden”, this one pits Mickey against a foe connected to nature. It presents a few fun moments but lacks much bite. 6/10. On Ice (1935, B. Sharpsteen): Mickey, Minnie, Donald and Goofy go out for a day of skating on a frozen pond. One could argue there are no leads in this ensemble piece. It presents some creative shots, so although it lacks a real story, it’s a good one. 7/10. Hawaiian Holiday (1937, B. Sharpsteen): Mickey, Minnie, Pluto, Donald and Goofy have fun on the beach at Waikiki. Another ensemble piece, this one doesn’t come across as a “Mickey” short. At least the varied cast gives it some punch; who can dislike a cartoon in which Donald dances in a grass skirt? 7/10. Moving Day (1936, B. Sharpsteen): Mickey, Donald and Goofy owe back rent and rush to move out before Sheriff Pete sells all their possessions. Yet another group offering and not a true Mickey-centric piece, the same pros and cons affect it. Actually, the Mouse plays even less of a role than usual here; Donald and Goofy carry most foi the load. Since Mickey’s usually pretty dull on his own, I won’t complain too much about the short’s inclusion here, especially since it’s a good one. 8/10. Orphan’s Picnic (1936, B. Sharpsteen): Mickey and Donald take a group of mouse orphans out for a picnic. The kids kind of seem like jerks. Here Mickey and Donald try to treat them to a fun time, but the orphans consistently abuse out heroes. Mickey takes this better than the Duck, which makes Donald’s reactions more amusing. 7/10. Maybe Starring Donald would have been a better title for this disc. He plays a major role in five of the seven shorts, while Mickey is the lead in only two. He does work in the other five, but remains a supporting character. 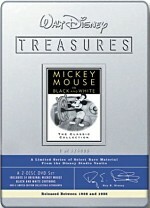 Couldn’t Disney have found five more true Mickey shorts to pack into this set? 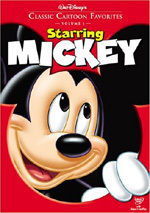 Starring Mickey appears in an aspect ratio of 1.33:1 on this single-sided, single-layered DVD; due to those dimensions, the image has not been enhanced for 16X9 televisions. If you’ve watched the other Mickey sets, you’ll know what to expect from Starring, as it presented consistently fine visuals. Print flaws varied but generally stayed minor for material of this vintage. Overall, the most significant issues related to light dust along with some occasional marks, speckles, grit and blotches. Still, I’ve seen much worse in regard to other flicks from the Thirties and Forties, and the defects remained quite modest as a whole. Colors consistently seemed strong. The tones were bright and vivid throughout the shorts, with very few exceptions on display. The cartoons stuck largely with primary colors, and these looked quite distinct and vibrant at virtually all times. Black levels also appeared nicely deep and rich, while shadow detail was clear and accurate throughout the shorts. Overall, I was quite pleased with the quality of Mickey. In addition, the monaural soundtrack of Starring Mickey matched up with the better than decent audio of prior sets. Dialogue sounded a little edgy at times, but for the most part, the lines were acceptably clear and accurate. Effects showed a bit of distortion and harshness, but they stayed fairly clean and distinct through the shorts. Music also demonstrated variable levels of shrill and rough tones, but this wasn’t unexpected, and the score seemed reasonably solid. Decent depth accompanied some effects, such as stomping of large characters, but the track was pretty thin and tinny as a whole. Varying levels of background concerns appeared throughout the shorts. I heard modest hiss at times during the cartoons. However, the tracks seemed pretty clean for audio of this era. Overall, the sound heard during Starring Mickey won’t win any awards, but I found the mixes to come across as pretty clear and accurate for their age. So what’s my beef? These aren’t really Mickey Mouse cartoons. He appears in all of them but truly stars in only a couple. You see much more of Donald Duck on display. I prefer Donald, so that makes the shorts entertaining, but it remains a misleading package. Whatever they call it, Starring Mickey does present a fair amount of fun. The cartoons come with good picture and more than adequate audio, though the disc lacks real extras. 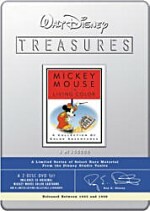 If you already own the Mickey “Walt Disney Treasures” sets, there’s absolutely no reason to get this one. If you don’t have those releases, however, and only want a little Disney entertainment, Starring Mickey would be a good collection to own.